Tigerwood decking is a fine hardwood with exquisite detail. Tigerwood, as its name suggests, emulates the look of a tiger’s coat with patterns of dark vertical stripes glazed with brown or red tones and lighter under parts. From a contractor’s perspective, it is – without a doubt – one of the finest quality, distinctive and exotic hardwoods available on the market today. From a customer’s perspective, Tigerwood is a highly regarded product because it’s strong, durable, great-looking, preservative-free and is naturally resistant to decay or dulling too. Quality Tigerwood decking is considered a renewable resource and harvested from managed forests, responsibly. And even though Tigerwood is similar to Teak in its quality and beauty, it is more cost-effective for use in outdoor structures such as decks. Archadeck of West County and St. Charles County is proud to offer Tigerwood — a truly superior, signature decking material with intricate details and visual aesthetics for your deck or other outdoor structures. 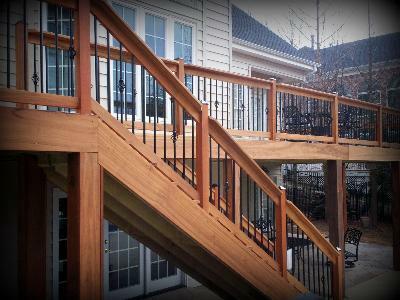 Click the link to our website, west-county.archadeck.com, to learn more about products like Tigerwood and other woods or hardwoods as well as newer composites, capped composite and vinyl decking products that emulate hardwood. Call us, 636.227.0800 with questions or to schedule an onsite meeting with a no-charge quote for any type of outdoor living space. We serve metropolitan St. Louis including St. Louis County, St. Charles, St. Charles County and parts of Illinois. If you don’t reside in and around the St. Louis area, go to archadeck.com to find other locations around the country. St. Louis Mo: Composite or Wood?